With a script, you can display in English Avec un script et des cookies de session, cette page peut être affichée en Français. Modern keyboards present, for the most enhanced, a little more than one hundred twelve keys, to manage more than several hundreds of characters. So, only the most current ones are each associated to a key. For a little less current characters as arobase or euro, a key combination is attributed to the character, using for these two examples AltGr, which is generally equivalent to Ctrl + Alt. For other characters, it is possible, provided the correct characters set is selected, to type the character with Alt + the numeric keypad. Press the Alt key, and while maintaining it depressed, type the code of the character on the numeric keypad : the character appears as you release the Alt key. no software conflict prevents from doing this operation. On my side, I am typing this on a keybard on which the typing of a character on the numeric keypad with the Alt key is deficient, when using remanent keys, which appears necessary on this 'special' keyboard with the Windows key in the upper right corner. So, I wrote for myself a program to type the special characters. To launch this program, you will need a shortcut. You can use a shortcut on the desktop or in the start menu, or easierly use a shortcut managing software as Wonderkeys (but this one is french). This dialog box is in French. I intend to adapt some of my program to English, this will probably be done in the order it will be demanded. By default, the selection is in the textbox, and the caps lock is activated even if this does not appear on the keyboard LED. This allows you to directly type a numeric code on the upper row of the keyboard. If you wish to use the numeric keypad, it is up to you to activate it. Once you typed the code of a character in decimal, you validate it with the Enter key, simply. For example, if you typed 156 in the textbox, when you depress the Enter key, a character œ appears in the window that was selected before (at least if this window allows to write in it, of course). The status of the caps lock is restored as it was before calling the program. Be careful to properly master the remanent keys, or to choose your keyboard shortcut taking this in account. If the Alt key is activated when you call the program, this can activate the menu of the application you were using before, so the typing of a character will not insert it into the document, and furthermore you will have to depress the Esc key to close the menu. If you will to insert a non-blank space that will not be considered as a space for word cesure, a button is present for that. You can click on it, or simply activate it with 'Alt I'. Some other special characters are emitted by their own buttons. If you do not know the code of another character you want to type, no problem : simply click on the 'Table de caractères' button (character table), or depress 'Alt T'. This will call the Windows application that you will find in Start, All programs, Accessories, System tools : the characters table. This tool allows you to visualize all the existing characters, and to select the good one by double-clicking on it. 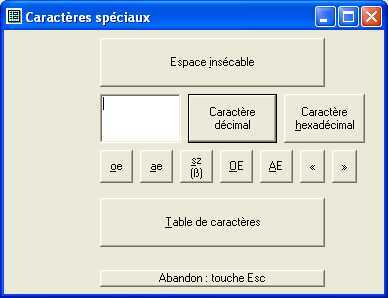 The button 'caractère hexadécimal' will interpret the contents of the textbox as a code expressed in hexadecimal (and send the corresponding character), this will only be useful to people who know what this means. It happens that the character is inserted twice. In fact it is generated in two places in the program, that do not both launch each time, for a reason that is not quite mastered yet. It seemed preferable to sometimes get the character twice, than often not at all. This program is available by clicking on the link hereunder on the left. It needs the VB6 execution kit. This kit is available on Microsoft's site, and is installed with other programs of this site that are proposed with an installation program as some more modules were necessary. ClavierNum.exe This program needs the VB6 execution kit. Load it from Microsoft's site, or install another program from this site before ClavierNum, for example, Retard, that delays the execution of a program. This program is proposed with an installation program, that installs the execution kit. After that, choose a directory to install ClavierNum in, the most usual is "C:\Program Files\ClavierNum".